If your dog has ever turned up his nose at the prospect of more of the “same old” dog food, these treats are for you. I've used them to make sure that Bear keeps his weight up during the summer months (he goes through these fast phases during the summer when it’s super-hot outside). > Start by taking 2 cups of your dog’s regular (everyday) food. > Cook completely before serving. 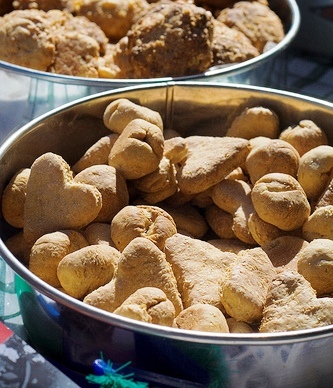 These treats are a great way to liven up Fido’s food and inspire his appetite. They’re also great for pooches who are watching their waistlines (so long as treats are given in moderation and do not exceed your dog’s daily requirement for food).